Firefly shows bioluminescence by “luciferin−luciferase” (L−L) reaction using luciferin, luciferase, ATP and O2. The chemical photon generation by an enzymatic reaction is widely utilized for analytical methods including biological imaging in the life science fields. To expand photondetecting analyses with firefly bioluminescence, it is important for users to understand the chemical basis of the L−L reaction. In particular, the emission color variation of the L−L reaction is one of the distinguishing characteristics for multicolor luciferase assay and in vivo imaging. From the viewpoint of fundamental chemistry, this review explains the recent progress in the studies on the molecular mechanism of emission color variation after showing the outline of the reaction mechanism of the whole L−L reaction. 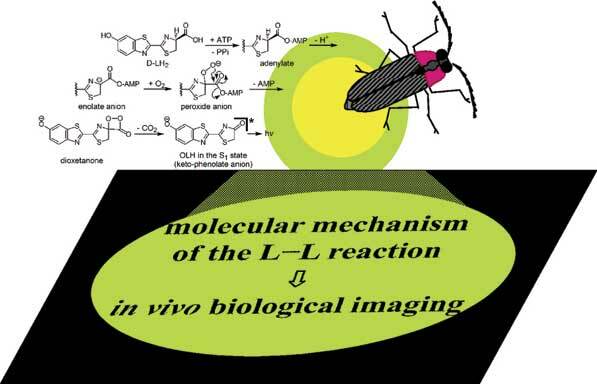 On the basis of the mechanism, the progresses in organic synthesis of luciferin analogs modulating their emission colors are also presented to support further developments of red/near infrared in vivo biological imaging utility of firefly bioluminescence. Firefly, Bioluminescence, Luciferase, Luciferin, Multicolor assay, NIR spectroscopy, In vivo imaging. Department of Engineering Science, Graduate School of Informatics and Engineering, The University of Electro-Communications, Chofu, Tokyo 182-8585, Japan.